Cut peel from lemon. Roughly chop rosemary. Melt butter in a small saucepan over medium heat. Add lemon peel and rosemary, bring to a boil, and then remove from heat and allow to cool for approx. 8 – 10 min. Discard lemon peel. Add flour, baking powder, sugar, and brown sugar to a stand mixer. Beat for approx. 1 – 2 min. until well mixed. Now, add vanilla extract, salt, butter, and egg. Beat for another 2 – 3 min. until well mixed. Roughly chop chocolate. Add to stand mixer and beat for approx. 1 – 2 min. until well incorporated. Cover dough and transfer to fridge for at least 1 hour. Preheat oven to 200°C/390°F. Line a baking sheet with parchment paper. Spoon dough into balls, approx. 1 tbsp in size, onto baking sheet, taking care to leave enough space between each. 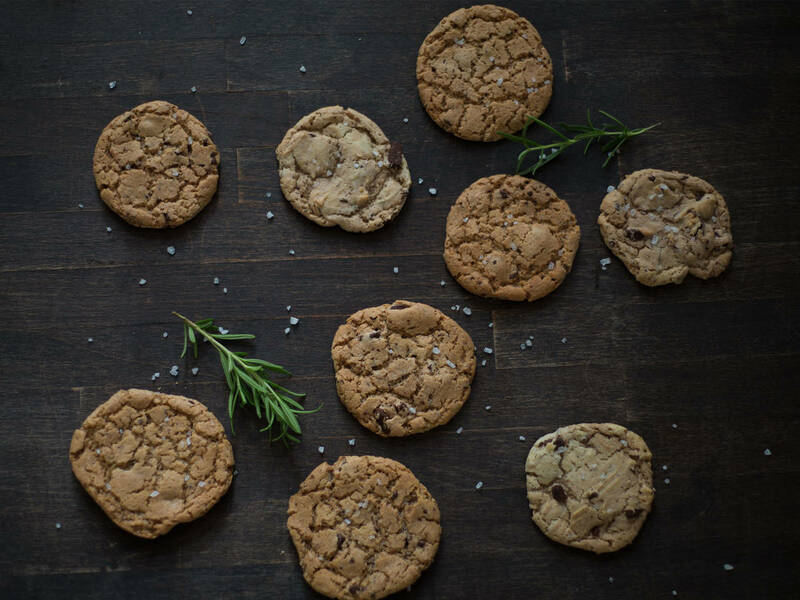 Sprinkle sea salt on top of each cookie. Bake in a preheated oven at 200°C/390°F for approx. 8 – 12 min. Enjoy!